All About Our Favorite Creatures – MOOSE! The plural of moose is moose. The collective name for a group of moose is a herd or gang. The moose is the state animal of Maine. The female is a cow, the young is a calf and the male is a bull. An adult bull can weigh up to 1200 pounds. The calves are born each spring and twins are not uncommon. Only the males have antlers, which they shed in the winter. They travel singly or in a small family group of a cow and her calves. They can completely submerge to eat the sodium rich water grasses and roots. The breeding season, called rut, is late September into mid-October. Their only predator is man and his rifle. Late May to mid-July might be the best time to see moose, but August through October is good, too. 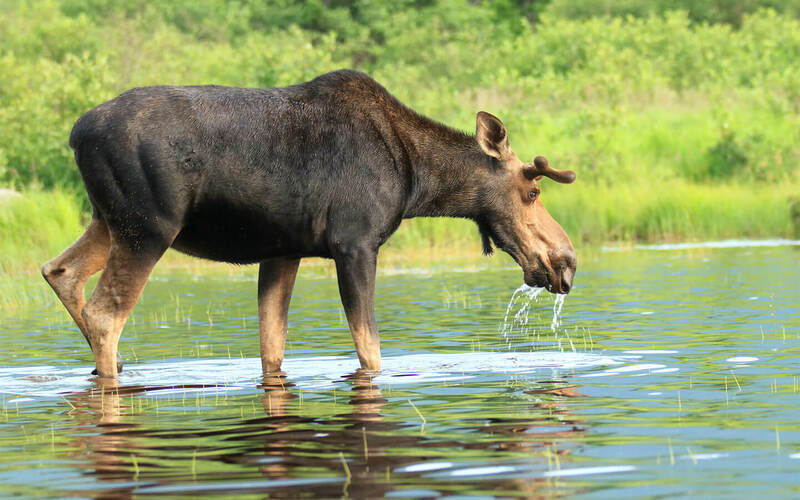 Moose come to the roads to lick the salts – a mainstay of their diet. There are 3 moose to every 1 person in the Moosehead area. The moose is the world’s largest deer. The moose can run 35 miles per hour and can easily swim 10 miles. Height at the shoulders generally ranges between 6½-7½ feet. In Europe and Asia, moose are called elk. A moose’s sharp hooves are its first line of defense. Moose are able to kick out in all directions, but generally use their front feet. Cow moose can live for as long as 20 years. Bull moose may reach 15 years. The sound made by a moose is referred to as a bark or bugle. Herds are dominated by one female. It is prime moose viewing season here in Maine. Book your spring getaway with us and get ready to see these incredible animals up close! Go on an adventure to view moose in their natural habitat. High moose sightings are expected! Have your camera ready to capture their beauty! Along with the moose, you may also come across loons, deer, osprey, gray squirrels, otters, beavers, snowshoe hare, and maybe even a bald eagle.